Holidays in the Heartland has been a Miami Valley tradition for over 15 years. Looking for a way to relax after your Turkey Day feast? Tune into two local radio stations for an evening of festive entertainment from some of Wright State’s most talented musicians. Wright State’s 15th annual Holidays in the Heartland concert will be broadcast in its entirety on WDPR 88.1 FM and WDPG 89.9 FM at 8 p.m. on Thanksgiving Day, Nov. 22. Holidays in the Heartland is a musical celebration of Thanksgiving and Veterans Day. 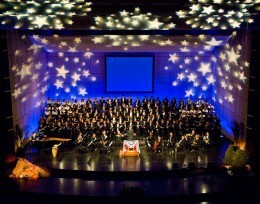 The 90-minute performance was recorded at the Benjamin and Marian Schuster Performing Arts Center in downtown Dayton on Nov. 4, 2012. The concert features some of the university’s most outstanding student vocalists and instrumentalists, joined by guest performers and host Shaun Yu of Dayton Public Radio. Holidays in the Heartland was presented by the Wright State Department of Music and Collaborative Education, Leadership and Innovation in the Arts (CELIA), an Ohio Center of Excellence located at Wright State University.